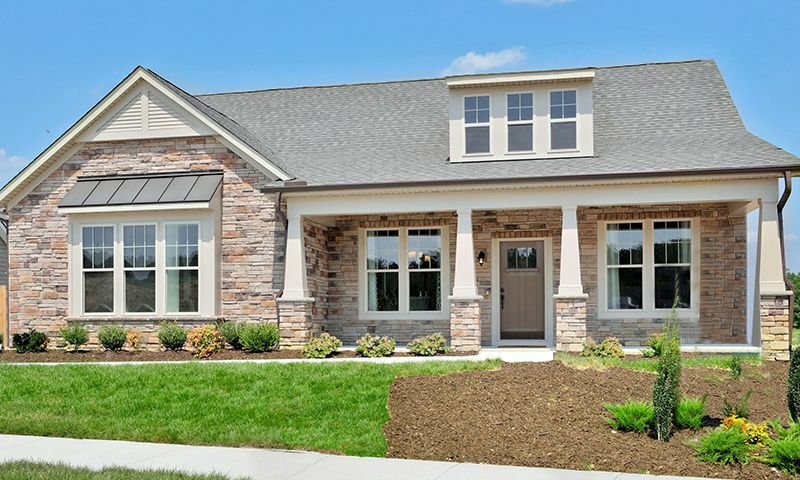 Greenwich Walk is a new 55+ community being built in Moseley, Virginia by both Stylecraft Homes and HHHunt Homes. Upon completion, there will be 350 homes. Both attached and single-family home styles are available. Set in the natural beauty of the Richmond area, residents will enjoy a low-maintenance lifestyle among the idyllic wooded hills of Central Virginia. As part of the FoxCreek master-planned community, residents will have access to the Terrace Swim & Racquet Club's amenities as well as those of a clubhouse within the community. Residents of Greenwich Walk will have access to an impressive set of amenities rivaling those of a resort. There will be a clubhouse at the center of the community that will not only house great amenities, but will also be a center of social activity. Homeowners seeking to stay fit and active can use the clubhouse's fitness center or relax in the sauna. Multi-purpose rooms can serve as venues for meetings, community gatherings, and more. Outdoor amenities will be designed to best take advantage of the area's natural beauty. Walking trails will weave through the community and circle a scenic pond. Homeowners will also be able to use the amenities at the Terrace Swim & Racquet Club, part of the FoxCreek master-planned community. A stately clubhouse surrounded by manicured grounds anchors this set of amenities. Multi-purpose rooms will be available for anything from business meetings to private parties and receptions. A fitness center with both resistance and cardiovascular machines will be an excellent place to keep up a workout routine. An indoor lap pool allows residents to enjoy swimming year-round. Outdoors, a large pool and patio are important social centers of the community. Three tennis courts allow for friendly competition among neighbors. Manicured lawns, green spaces, and walking trails highlight the serene natural beauty of Central Virginia. There will be 350 homes that make up Greenwich Walk. Homebuilder Stylecraft Homes is developing single-family homes and attached townhomes. Villas range in size from 2,041 to 2,212 square feet with two bedrooms, two-and-a-half bathrooms, and attached two-car garages. Townhomes are between 1,721 and 2,101 square feet with two bedrooms, two-and-a-half bathrooms, and attached one or two-car garages. All homes have features that appeal to active adult homebuyers like first-floor master suites with spacious walk-in closets, and luxuriously appointed bathrooms. Flex rooms allow homeowners to customize their new home and make it truly their own. HHHunt homes is building single-family homes at Greenwich Walk from 1,940 to 2,174 square feet. Four floorplans will be available with two or three bedrooms, two or two-and-a-half bathrooms, and attached two-car garages. All models have first-floor master bedrooms with elegant bathrooms and walk-in closets. Inviting, open floorplans lend a welcome and spacious feel to these homes. Residents at Greenwich Walk can enjoy lots of activity and recreation or simply relax in a tranquil, natural environment. Access to two clubhouses provides ample opportunity for active enjoyment of the community. Fitness centers and an indoor lap pool allow residents to stay in shape regardless of the weather. After a workout, homeowners can relax in the sauna or lounge by the outdoor pool with a good book. A variety of multi-purpose rooms at the clubhouses are available for gatherings both large and small. It will be easy for residents to take advantage of the great Central Virginian climate. Neighbors can challenge one another to an exciting game of tennis or enjoy leisurely walks in the quiet tranquility of the neighborhood. Residents will have more time for the activities they love, knowing that common area maintenance and lawn care is covered by the homeowners' association. Greenwich Walk is located in Moseley, VA which is a part of the Richmond metro-area. Its convenient location makes routine errand and shopping trips easy. Hancock Village shopping center is four miles away. Here, one can find a Food Lion, Walmart, Lowe's, and numerous other retail stores and restaurants. Another two miles east along Route 360 is the Commonwealth Center with a Fresh Market, Target, movie theater, and even more retail stores. The state capital of Richmond is about 26 miles away and, as one of the United States' most historic major cities, provides active adults with plenty to see and do in an urban environment. The city is filled with enough historical sites, museums, and cultural attractions to make every trip a new and exciting experience. Richmond International Airport is 38 miles away, making long-distance travel easy. It is easy to see why Greenwich Walk will be a highly desirable place for active adults to call home in Moseley, VA. Residents of Greenwich Walk will also have access to the amenities of the Swim & Racquet Club at FoxCreek. Check back soon for more information on the lifestyle in Greenwich Walk. Townhomes are between 1,721 and 2,101 square feet with two bedrooms, two-and-a-half bathrooms, and attached one or two-car garages. All homes have features that appeal to active adult homebuyers like first-floor master suites with spacious walk-in closets, and luxuriously appointed bathrooms. Flex rooms allow homeowners to customize their new home and make it truly their own. Villas range in size from 2,041 to 2,212 square feet with two bedrooms, two-and-a-half bathrooms, and attached two-car garages. All homes have features that appeal to active adult homebuyers like first-floor master suites with spacious walk-in closets, and luxuriously appointed bathrooms. Flex rooms allow homeowners to customize their new home and make it truly their own. We have only been in this community a little more than a month, we are very pleased with the activities we see available to us throughout the community. Looking forward to forging new friendships and relationships. 55places.com is not affiliated with the developer(s) or homeowners association of Greenwich Walk. The information you submit is distributed to a 55places.com Partner Agent, who is a licensed real estate agent. The information regarding Greenwich Walk has not been verified or approved by the developer or homeowners association. Please verify all information prior to purchasing. 55places.com is not responsible for any errors regarding the information displayed on this website.